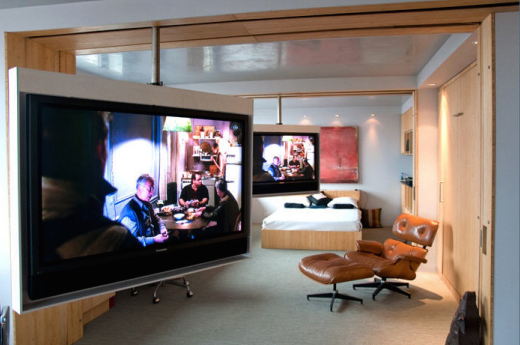 Trak-kit frees flat screen televisions from the anchored tyranny of archaic and bulky wall mounts, allowing for the ultimate TV, monitor, or digital display viewing. It’s a customizable track system that mounts to the ceiling and houses integrated A/V wires, components and the SmartMotor all out of view inside the overhead track system. 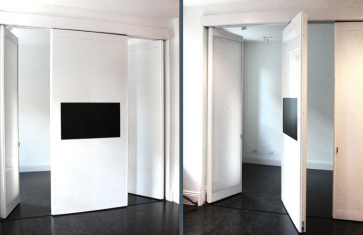 The track can be installed in nearly any shape and any length, allowing for linear movement, 360 degree rotation as well as vertical movement. 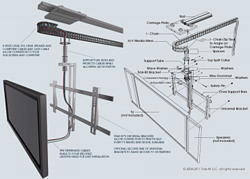 Applications for Trak-kit range from residential to commercial, and in any industry utilizing flat panel displays. The robotic, automated Trakkit is getting particularly popular in conference rooms that hold in-person meetings, virtual conference meetings, and a combination of both. 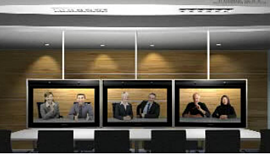 Using programs written into the SmartMotor, paintings with flat panel monitors mounted on the back can move along the track in a board room and rotate, positioned over a chair, so that the digital display faces the conference table… or any direction desired. One multinational pharmaceutical client wanted a state of the art telepresence system for their 17ft long board of director’s conference table, requesting that panels of the wall weighing over 600 lbs. move to reveal two 65” Panasonic Pro monitors that came forward and rotated 180 degrees along a 42 in track. The panels then moved back into their original position flush with the rest of the wall with only 3/8” clearance between the mobile wall panels and solid wall. When faced with high-end automation demands, Trak-kit trusts the SmartMotor. Just because Trak-kit has mastered the mobile flat screen doesn’t mean they’ve stopped innovating. As video calling gets increasingly popular for the masses (thanks to programs like Skype or the iPhone’s FaceTime), bandwidth and compression get better and high def video calls will become the norm. Why not video chat using a monitor that makes your pal life size, one that can alternate between portrait and landscape, and has a built-in camera controlled by the call-ee? Best of all, you can continue your call as you move from living room to kitchen, no longer glued to a desk or power outlet. This is the future of telepresence, envisioned by Trak-kit. Currently, Trak-kit is also looking at the electric signage industry (such as digital billboards) to combine mobility, aesthetics and technology. Things that move get more attention and with the flexibility of digital display advertising, Trak-kit envisions using SmartMotors, autopilot programs and motion/heat sensors for maximum exposure of digital advertising. With the help of the SmartMotor, Trakkit is helping the industry move forward, in the truest sense of the words.